Okay, so I lied. This is what I made for dessert on the boy's birthday. I wasn't going to blog this as I wasn't happy with the quality of the photo - this was from the first batch and I was slightly drunk at this point so no longer capable of perfect operation of a camera. However, the boy said the photo looked great so the recipe gets to see the light of day. I wanted a dessert that was special enough to be a treat, wasn't horribly sweet, and which would complement the bottle of Sauternes I had bought. As the boy in question loves peaches (though, I suspect is more partial peach iced tea) this seemed like the perfect solution. 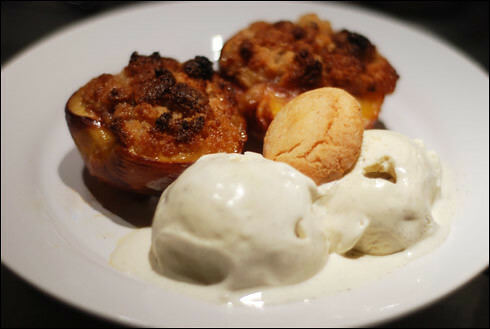 If you've had a large or indulgent meal, two peaches will easily serve four people. However, if you're still hungry, one each is plenty. Preheat the oven to 175°C. While the oven is heating up, crumble the amaretti biscuits into a bowl then melt the butter in a saucepan. Mix together the biscuits, butter, honey and sweet white wine, then slice the peaches in half, remove the stones and place cut side up in an oven-proof dish. Spoon a heaped teaspoon onto the flat side of each of the peach halves, then drizzle with a little more sweet white wine and honey. Sprinkle with demerera sugar and then bake in the oven for 15-20 minutes, until the topping turns golden. Serve with ice cream or crème fraîche and a glass of lightly chilled sweet white wine. Wow I will definitely be trying this it looks great! This sounds great!! I will definately try it!! My family LOVES all kinds of fruit desserts! Oh wow, this sounds yummy! And because it's mostly fruit - I can pretend it's healthy! I love the thought of the amaretti and peach combo. So delicious.